When customers come into the store looking to buy a DSLR camera and we’re educating them about the key differences between their choices, one of the concepts that comes up time and again is how the size of the image sensor affects your field of view. 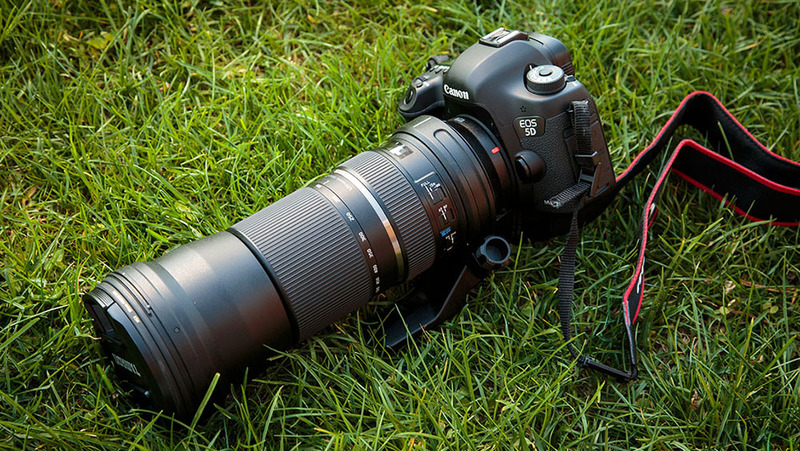 For someone who is just getting into photography, it’s often difficult for them to visualize how the 1.5x (for Nikon shooters) or 1.6x (for Canon shooters) magnification on the APS-C (or cropped) image sensors will impact their shots. To give them a general sense of the biggest difference between a cropped sensor vs. a full frame sensor (besides the costs, dynamic range, etc.) I do a practical demo by attaching a prime lens on both types of cameras and ask them how much “more” (or less as the case may be) they can see through the viewfinder. That usually produces an “AHA!” moment. Because this technique tends to work so well, I thought I would try to recreate the experience here on the blog. To that end, I checked out our Canon mount Tamron 150-600mm lens and one of our Canon 5D MKIII‘s to use along with my trusty Canon 7D to conduct my little demonstration. 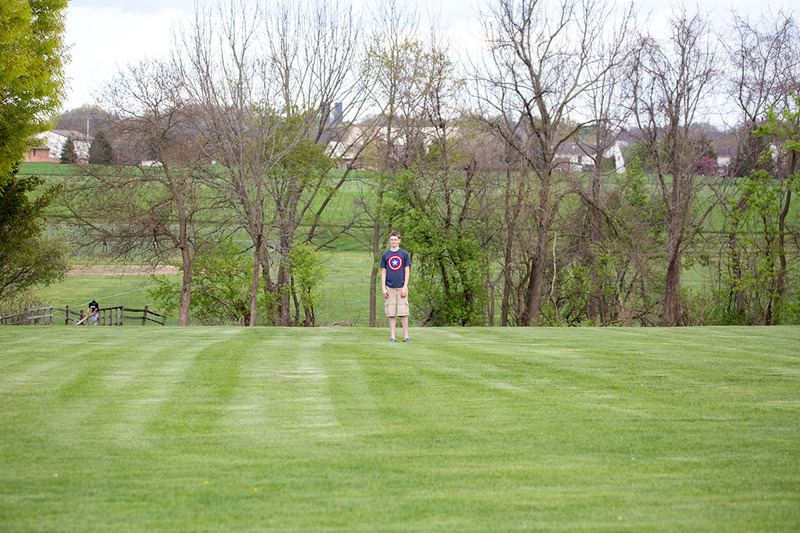 I took my somewhat-willing oldest son to the field behind our house and had him stand at a fixed location on a marked spot. I then set up my tripod at a fixed location about 40 yards away. 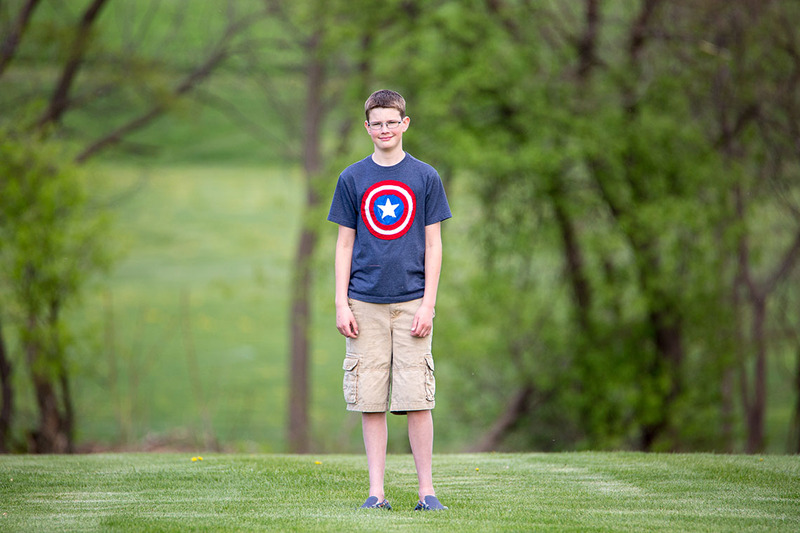 Neither my son nor my tripod changed position as I swapped out the cameras and focal lengths. The only thing that changed rapidly was my light. Which, as you can see by my inconsistent color temperature and my son’s squinting, was peeking in and out of the clouds during the entire test. For each camera, I took a few shots at 150mm and 600mm with the Tamron telephoto and didn’t crop or straighten any of these photos after the fact. 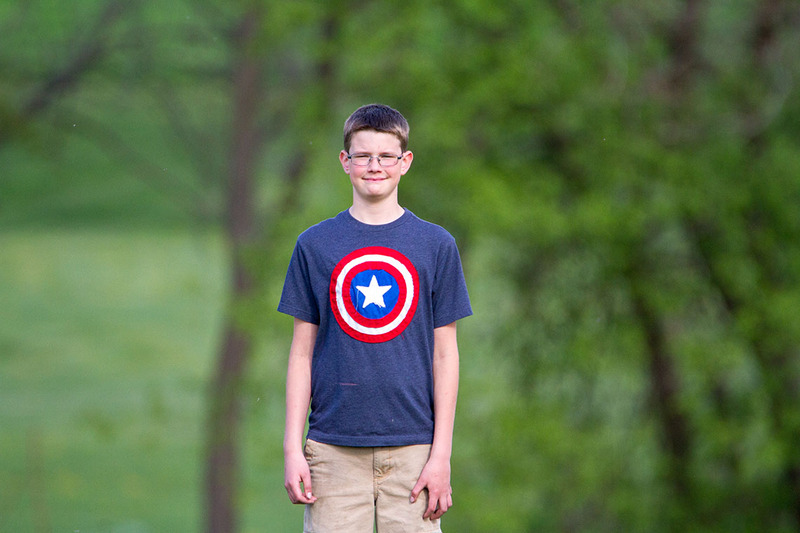 The photo below is my first shot with the full frame 5D MKIII at 150mm. 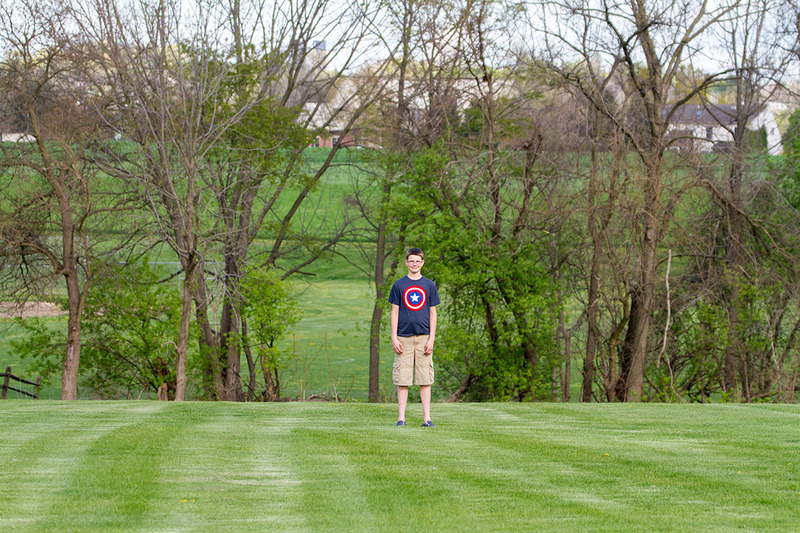 Note how much space is above, below, to the left, and to the right of my son as well as his size in the frame. 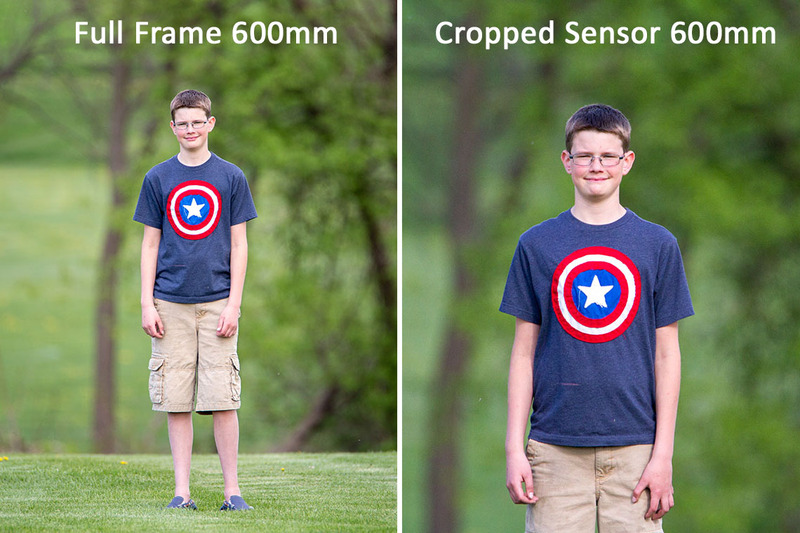 Note the difference on the shot from the 7D at the same focal length (150mm.) My son has gotten larger in the frame and there is less space on all sides. In particular, check out how much less of the foot bridge on the left you can see. 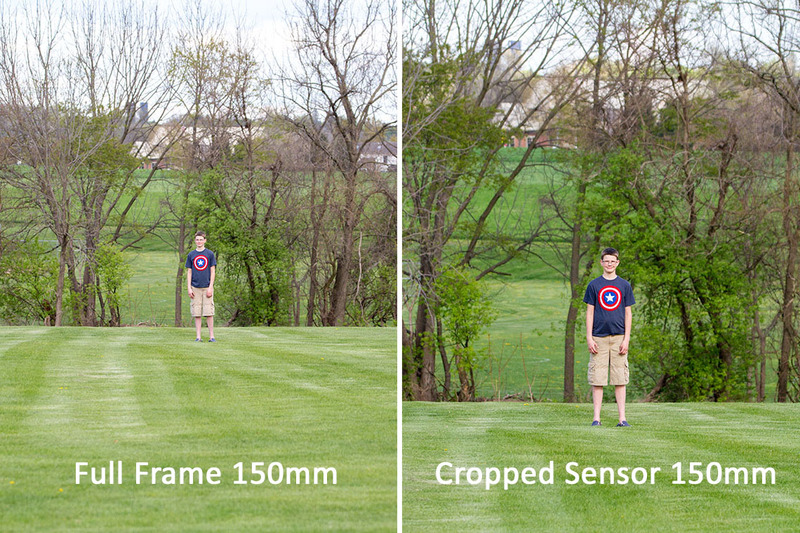 How the sensor size of the two cameras affects the range of your camera starts to become very clear at 600mm. With the full frame camera at this focal length, I can still get a full body shot of my kid in the frame with room to spare. On the cropped sensor 7D at 600mm you can really see how tightly the subject starts to get framed. For good measure, here’s a side-by-side comparison of each shot. To put it simply, you get more reach out of a cropped sensor body. If you were basing your camera purchase on the strictly on the reach of your focal lengths alone (very few customers do or should), the choices are pretty clear. If you’re looking for extra reach (sports photography, birds, etc. ), a cropped sensor body might be what you’re looking for. If you are in constant need of a wider angle of view (landscape photography, group portraiture, real estate photography) investing in a full frame camera might be the direction you want to take. In reality, there’s a laundry list of considerations to take into account when thinking about what’s important to you in your new camera purchase. There’s tons of pros and cons for each sensor type, but hopefully this will at least clear up one of the key differences.